Probably, Goa is the only destination in India which is on the bucket list of everyone, ranging from beach lovers to midnight owls and photographers to history enthusiasts. Today, Goa has gained immense popularity all over the world on account of the presence of pubs, bars, beaches and churches. Therefore, it is no wonder it is one of the foreigners' favourite destinations in India. At some point in time, we have all planned a trip to this wondrous world. Who wouldn't love to laze by pristine sandy beaches while sipping a refreshing drink? But do you know the beauty and the importance of Goa is way beyond its beaches and party spots? If you would really love to know more about Goa, then you must read the following facts related to this party capital of India. If you think Kerala, Maharashtra or Karnataka is the richest state of India, then you really need to correct your facts. As per recent reports, Goa has the highest per capita income, thereby, making it the richest state in the country. On an average, each and every person living in Goa produces an income of about 2 lakhs annually. Well, that's something every other state should look forward to. This beautiful state has also been ranked as the best-placed state in terms of infrastructure and living standards. How can the state which has become a synonym for the party capital be deprived of bars and party destinations? Certainly not. Therefore, Goa is home to more than 7000 bars today and all of them are visited by thousands of locals and tourists every year. St. Francis Xavier was a highly revered personality amongst Christians as he was the person who was on the mission of spreading Christianity all over the world. While on his voyage to China with the thought of preaching the gospel, he died and his body was brought back to Goa in the 16th century. His body is still kept inside a glass case in the Basilica of Bom Jesus, and hence it is often termed as the non-decomposing body. 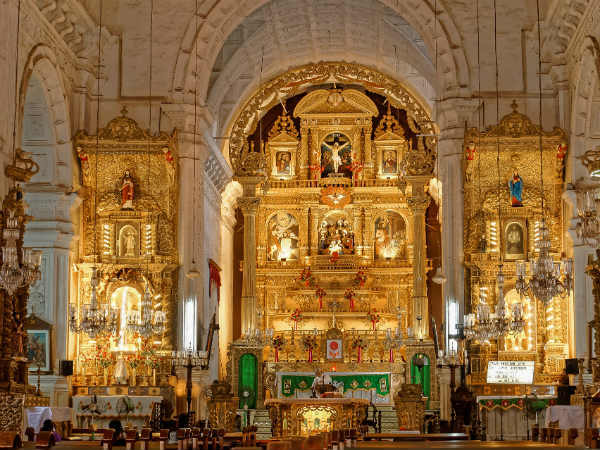 The Basilica of Bom Jesus is one of the most popular churches in the world and is a UNESCO World Heritage Site. Tourists from all over the world frequent this age-old monument which is also known for its remarkable architecture. It was constructed in the late 16th century and since then, it has been standing strong narrating the legends of its survival and existence. If you are a history lover or an architecture enthusiast, you shouldn't miss out on this marvellous beauty. If you think Goa is made up of churches, beaches and bars, then you haven't explored it properly. To everyone's surprise, about 60% of the total land of Goa is under the forest cover today. Therefore, it wouldn't be wrong to say that this party capital is home to some of the richest forests with rare flora and fauna. So, next time while in Goa, do visit its beautiful wildlife sanctuaries and forested expanses. Who knows you might end up discovering a new place? Bodla, Molem and Mhadei are some of the must-visit wildlife sanctuaries here. Goa is also the state which houses India's first-ever medical school and a printing press. The medical college was set up in the 18th century during the reign of the Portuguese. It is also one of the oldest medical colleges in Asia today. The first-ever printing press started functioning in the year 1956 when it was brought to St. Paul's College in Goa. To your surprise, the printing press was also the first-ever in Asia. Did you know about this?